Invadopodia are actin-rich structures that are present at the basal surfaces of cells that are capable of crossing extracellular barriers, such as cancer cells. The primary function of invadopodia appears to be the focal degradation of the extracellular matrix (ECM) through the secretion of matrix metalloproteinases (MMPs) . The formation and function of invadopodia can be described over defined steps that include initiation, extension, ECM degradation and disassembly. Invadopodia are found in cancer cells with high metastatic potential, whilst podosomes are generally present in blood cells of myeloid and monocytic lineages. Invadopodia are elongated ventral projections that extend into the underlying ECM, whereas podosomes are rarely seen to project into the matrix. Invadopodia are few in number, approximately between 1 to 10 per cell, whilst podosome numbers can range between 10 to several hundred depending upon the cell type. Invadopodia have a longer lifetime and have been observed to persist for over 8 hours , whilst podosomes generally have short half lives, lasting only a couple of minutes in an actively migrating cell. Invadopodia degrade the ECM with a much greater efficiency than podosomes. The basic structure of an invadopodium consists of a F-actin core similar to that found in podosomes. Microtubules and intermediate filaments have also been detected in mature invadopodia . Actin filament nucleators and their regulators such as the Arp2/3 complex, N-WASP (neuronal Wiskott-Aldrich syndrome protein), WASP-interacting protein (WIP) and cortactin  are also found localized to this structure. 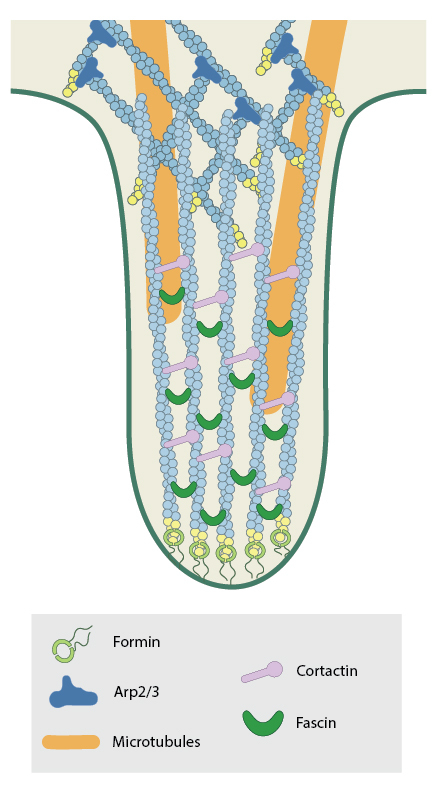 In addition to the podosome-like structure at their base, invadopodia contain a substantial number of actin filaments arranged as parallel bundles, akin to those observed in filopodia. Cross-linking proteins such as fascin are abundant in invadopodia, and indeed there is a strong correlation between cancer cell invasive potential and fascin expression (, as reviewed in ). Importantly, invadopodia also lack the well established multimeric protein complex that encircles the podosomal actin core . It is well established that a ring of integrins are present in podosomes and mediate adhesion with the ECM. In recent years as podosomes and invadopodia have begun to be identified as similar but nonetheless distinct structures. For example, despite being prominent in podosomes, few studies have shown integrins to be associated with invadopodia or play a role in integrin-dependent adhesion in the function of invadopodia . 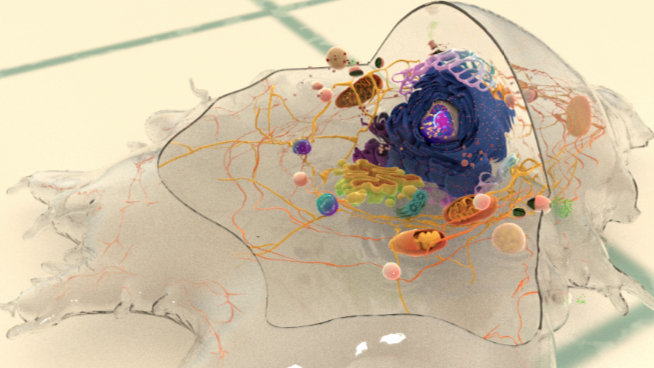 Unlike podosomes which can be found in cells under normal physiological conditions, invadopodia are found only in pathological states, most commonly in invasive cancer cells. To this end, invadopodia serve to enhance tumor metastasis by inducing basement membrane disruption through local matrix degradation . To achieve this, the targeted release of surface-exposed proteases (including MMPs) is required . Invadopodia mark the first steps of tumor cell invasion .